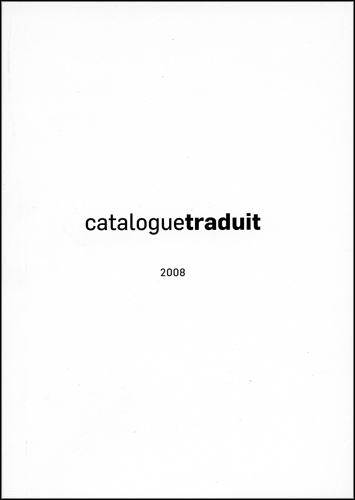 Catalogue Traduit consist of ten French essays on themes bifurcating from, and illustrated by, works by artist Carla Zaccagnini. Designed by Marilyn Fernandes, the book features texts by: Martin Breaugh, Vicky Chainey Gagnon, Larissa Joachim, Isabel Koellreuter, Mark Lanctôt, Cécile Martin, Catherine Sicot, Carl Trahan, Julie Tremble, and Thiffany Wilmouth. Produced by the gallery for Zaccagnini’s exhibition, this is the fourth in a permutating series done by the artist, the first three being in Portuguese, Spanish, and English. The entire series is available for viewing in the gallery bookstore.